Marco Rubio’s path to victory requires major establishment backing. Marco Rubio sure could use some help from his Senate colleages. 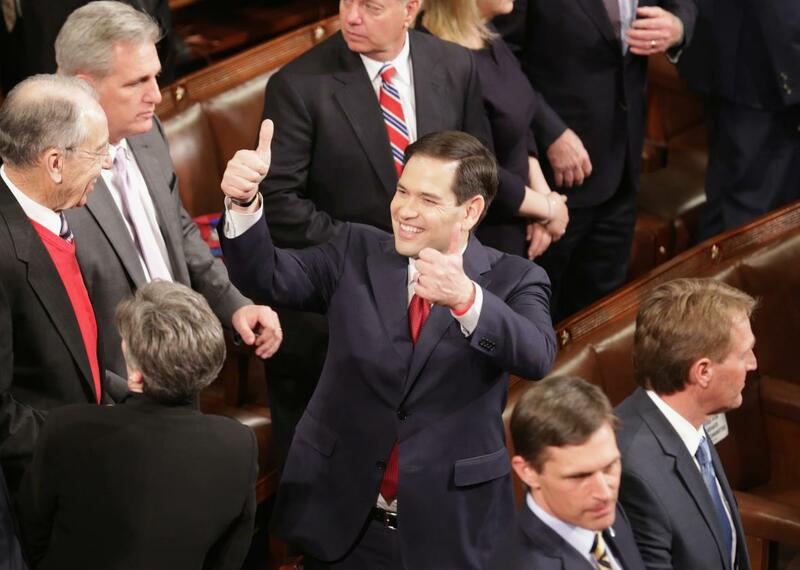 Above, he gives a thumbs up to members of Congress before the State of the Union on January 12, 2016. This past fall, shortly after he embarrassed Jeb Bush on the CNBC debate stage, Marco Rubio was widely hailed as the Republican Party’s savior, the man who would consolidate enough establishment support to best Donald Trump and Ted Cruz on his way to the GOP nomination. It was an order-restoring role Rubio was born to play, and one that many politicos and pundits—myself included—had long expected would ultimately produce the nominee. Flash-forward to today, and it’s clear things haven’t gone as planned. Iowa now looks like a two-man race between Trump and Cruz, and New Hampshire like a two-man race between Trump and Trump. Marco, meanwhile, remains the nominal establishment favorite—but one who can’t point to any state on the map where he’s currently favored to post an early, momentum-building victory. Things have gotten so bleak that Rubio’s camp is now openly touting a ladder-climbing path to the nomination that looks more like a lost cause: a third-place finish in Iowa, followed by a second-place finish in New Hampshire 8 days later, and a first-place finish in South Carolina 11 days after that. And even that, to put it nicely, is not going to happen unless something changes—and fast. While Rubio is on pace to best his Republican rivals not named Donald or Ted in Iowa, he’s locked in—and currently losing—a five-man race for runner-up in New Hampshire with Cruz and his three-establishment rivals: Bush, John Kasich, and Chris Christie. Even if Rubio gets silver in the Granite State, he’ll face a steep uphill climb in South Carolina, where he’s currently polling in distant third place behind Trump and Cruz and where he’ll almost certainly have to compete with Jeb—who is unlikely to drop out before then given his cash, his name, and his recent endorsement from South Carolinian Lindsey Graham—and possibly Kasich or Christie as well, if either keeps things close in New Hampshire. Central to Rubio’s 3-2-1 plan, meanwhile, is the belief that a third-place finish in Iowa and a second-place finish in New Hampshire will somehow steal the spotlight from Trump and Cruz, the former of whom could have just swept the two most discussed nominating contests in the country by then. Godspeed, Marco! So game over for Rubio? Not yet. The primary calendar is back-loaded with a number of delegate-rich, winner-take-all states that will allow an establishment-backed candidate with a (relatively) more moderate image to dream of a comeback victory. But to take any advantage of that opening, Rubio really, really needs to convince the GOP establishment to finally, finally rally around him. Rubio remains the establishment’s best, and perhaps only real hope. Yes, he has been unable to consolidate the establishment vote—perhaps better defined as the non-anti-establishment vote given the current mood of the electorate—despite the early hype, but that is as much his failing as it is the establishment’s. A handful of lawmakers endorsed Rubio this fall when he looked to be on the rise, but what was supposed to turn into a flood never grew beyond a trickle. According to FiveThirtyEight’s endorsement tracker—which weights the endorsements of congressmen, senators, and governors—Rubio still trails Bush in the endorsement race, in large part because a historic number of lawmakers and governors remain on the sidelines at this point in the race. It’s pretty difficult to rally establishment-minded voters to your cause when your establishment colleagues are sitting on their hands. Meanwhile, Rubio’s been left carrying the burden of the establishment tag without enjoying any of the benefits that come with it. The Republican Party could change that tomorrow if a few dozen elected officials called a press conference to endorse Rubio, who is pretty much the Capitol Hill homecoming king of the GOP field. At this point, it’s also unclear what other choice the party has. Their other establishment options consist of: Bush, a man loathed by conservative voters; Kasich, a man who loves to tell conservative voters they’re wrong; and Christie, a man who appears to be four years and one bridge-themed scandal too late. Rubio’s rickety ladder plan to the nomination is a stroll compared to the paths those three men face. Rubio, meanwhile, is by far the most conservative of the party-approved foursome, making him the one best suited to survive the establishment stigma and still appeal to more conservative voters. He also has the best favorability ratings of the bunch, which—along with his strong debate performances—allows him to make the best general election pitch of anyone in the GOP field. Toss in his biography and ability to win over GOP mega donors, and it becomes easy to remember why he was touted as the party savior to begin with. His most-talked about weakness, other than the not-leading-polls-anywhere-part, is his ground game, or lack thereof—a problem that would be directly addressed if sitting Republican congressmen, senators, and governors finally started to lend a helping hand. As much as establishment is a dirty word on the campaign trail, there’s no denying that elected officials are elected officials thanks in large part to the establishment machines in their states. That’s exactly the type of organizational advantage that Rubio is missing, and that Washington Republicans can provide. If the GOP truly wants Rubio to save it from Trump and Cruz, then the party is going to have to save Rubio first. I honestly have no idea what they are waiting for.